Precision Torque’s permanent magnet clutches and brakes have a torque rating up to 300 lb-in. 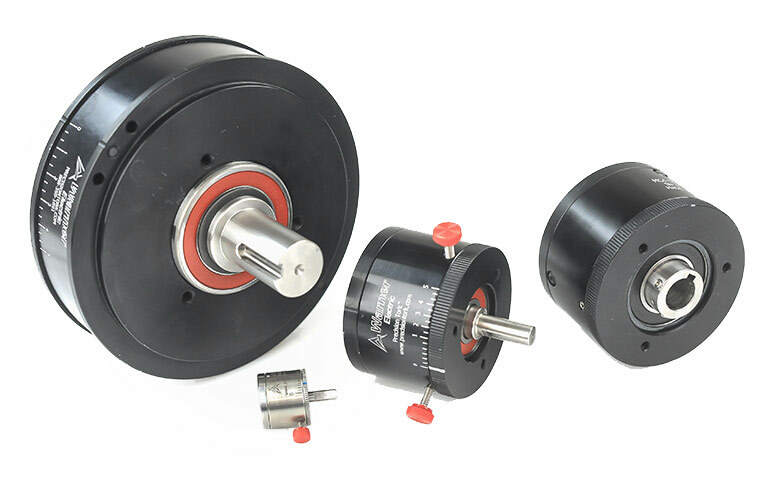 These units operate with two fixed magnets that react with a rotating third magnet to produce SMOOTH torque. The torque level is adjusted by changing polar relationships of fixed magnets. The torque ratings of our units range from 1 oz-in to 300 lb-in and offer an extremely accurate torque setting, independent of speed. Manual settings are accurately repeatable. Precision Tork units are the #1 choice for slow speed applications. They offer excellent overload and jam protection for all drive train components and also provide soft starts with zero slip when a preset torque is reached. Precision Tork permanent magnetic clutches and brakes do not require maintenance and provide extremely long life. We offer zinc plating for superior corrosion resistance and all stainless steel shafting. Precision Torque offers a complete metric line as well as a stainless steel line for wash-down applications. We also offer additional bore and shaft sizes or other custom features to meet the needs of your application.